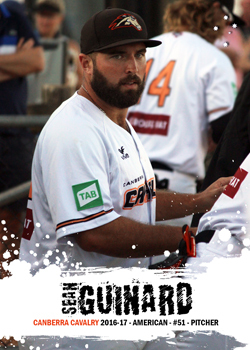 Having pitched 4 innings for the Canberra Cavalry back in the 2012-13 ABL season, Guinard returned to Cavalry roster after a 4 year gap and made the most of his opportunities, starting 10 games and compiling a 4-2 record. Guinard is an American who originally came over to play baseball for a local ACT club before his brief original ABL stint. He ended up marrying a local girl and staying, even taking up playing Australian Rules Football in the AFL Canberra competition. I have him listed as "American" but I don't know what his actual status is - having married a local and settled down here, I don't know whether he's taken out Aussie citizenship or not.